Before you correct me, I know that the premise of the movie involves the two main characters writing emails to each other, not letters. But I stand by my title. While the exquisite wait for a letter to arrive is not there, since emails arrive in another’s inbox the moment you send them, the format is very much like a letter. They pen long musings about their day to the other, spewing forth their troubles and frustrations. Thus, it is very much letter writing, just with a laptop and dial-up instead of pen and paper. What I like so much about You’ve Got Mail is its innocence about the internet. There is so much seediness online now, with people looking to foster romantic relationships quickly and superficially, with no intention of commitment. Need I even mention the extensive presence of catfishing, which is so prevalent we have a TV show dedicated to sniffing them out? There is, in contrast, no pretense in this movie. Both Meg Ryan and Tom Hanks’ characters are exactly who they present themselves to be online, and it is this authentic-ness that allows them to make a connection. When rewatching the movie, I realized something I hadn’t noticed before: Kathleen (Meg Ryan) and Joe (Tom Hanks) are kind of cheating. They have fostered this online relationship with each other, which they go to great lengths to hide from their respective partners. This aspect actually gave the movie the opportunity to discuss the ambiguity that comes with online relationships. Because these relationships are online, do they really count as real? While Kathleen and Joe say it’s just online and not a big deal, their behavior and investment in this online relationship shows otherwise. However, even though there is more to this online relationship than either one is willing to admit, there is a recognition that if something that happens online surpasses all your expectations, it is time for it to move into the real world. In the online world, things stay ideal and rose-colored, but it is only in real life that love has a tangibility. Joe recognizes this, which is why he knows he needs to establish a connection with Kathleen in real life and get her to see him without the hate. Otherwise, whatever they had formed with each other online would become dust. Both Ryan and Hanks do such a great job of making the act of emailing look so engaging and personable. It made me miss the days when my best friend was in Australia and we would write long emails to each other. This is weird to say since I should prefer the immediacy that certain apps now give me in terms of communication. I just think there is something so lovely about receiving an email/letter filled with someone’s ramblings; a kind of coherent insight into their mind. This is really no surprise, considering that Meg Ryan was the Rom-Com Queen at this point and everyone loves Tom Hanks. His character of Joe Fox is really the closest he has come to being a bad guy. But despite his villainy of being the big bad chain bookstore guy who forces Ryan’s character to have to close her shop, there is a kindness and niceness to him. He’s great with children, tolerant of his current girlfriend’s rather selfish and self-centered ways, and he is extremely self-aware. When he discovers Kathleen is the woman he has been talking to online, he realizes he cannot reveal that it is him because of the discord they share in real life. Yet he cannot bring himself to stand her up, so he still shows up to distract her from the fact that her online guy has not shown up. Ryan gets the easier role, where we would of course support her and root for her, since her livelihood is going away. The changes for her are more in the vein of stepping outside her safe zone. She has always taken the safe route. She took over the shop from her mom because she was supposed to, she was dating the weird obsessed-with-his-typewriter guy because she thought they were suitable. Joe Fox’s entry into her life forces her to step outside of what she knows, and to experience a different type of life — having a job she never thought she would have and being with a man she thought she needed to hate. 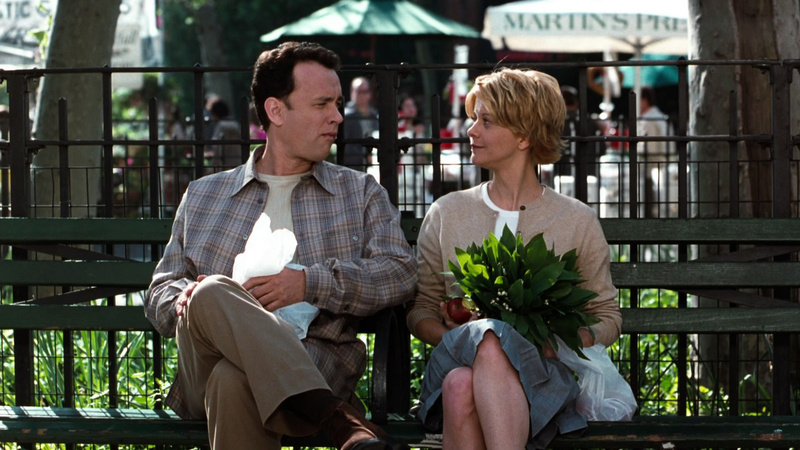 You’ve Got Mail is a Rom Com done right. We have likable protagonists, decent supporting cast and a good narrative. Where have all the good Rom Coms gone? I don’t think I could name any recent ones that conjure up the amount of magic this one does. My theory is that modern Rom Coms forget the art and tension that goes into making an electrifying moment. What do I mean by this? For example, there is this moment Kathleen and Joe share when she is sick. She is arguing with him, quite ardently and passionately, when he gently places his fingers on her lips. She stops talking. They look at each other, the air filled with a palpable ‘something’, they milk the moment till we are on the edge of our seats … and then he leaves. A Rom Com, when done right, must have a moment like that. This is why Fifty Shades fails as a romantic movie, because nothing is left to the imagination, even though we are begging to not see anymore, with most of us going full Oedipus Rex for having seen this horror of a movie. Side note: When I say Oedipus Rex I mean him blinding himself and not him killing his father and sleeping with his mother. In the words of Jane Austen, “Let us never underestimate the power of a well-written letter.” You’ve Got Mail reminded me of that, bringing back the nostalgia of romance on a page, the baring of one’s soul and the idea that nothing soothes quite as much as the dedicated prose of another. But alas, it is a time long gone, only existing in movies such as this. I still have hope though, since we have modern romantic movies like To All The Boys I’ve Loved Before, with letter writing embedded in its premise. Maybe tomorrow my heart will beat a little faster when Google informs me that I have mail, even if it’s just spam. Thanks for reading! What are your thoughts on You’ve Got Mail? Comment down below! If you enjoyed this article, subscribe to MovieBabble and share the article on relevant social media sites. I’ve never seen the film, but I do plan to write hand-written letters to my future wife if I ever get one, lol! Awww! That’s so sweet 🙂 It is an endeavour we should all strive towards I think. Watch ittttt! I hate this movie because I think their relationship is unbelievable. He makes her lose everything by shutting down her business, her whole life–why would she ever be with him? Sure, they have some chemistry, but…still. I do agree that some things are done kinda right in You’ve Got Mail–it’s written well like all Nora Ephron movies are. This article helped me see some good in it. But I just can’t get past the fact that HE SHUT DOWN HER BUSINESS. As someone whose family owns a small business, I find this very unrealistic. I don’t think he set out to ruin her business. He opened a chain bookstore and as a business owner, I don’t think he could set out to purposely fail. Ultimately, she couldn’t outrun the fact that people want bargains and cheaper books. She did all she could, and made the decision to close the shop since she could see the writing on the wall. It was always clear that she was running the shop because she felt like she was supposed to, as a way to honour her mom. It also held a lot of happy times, so of course this was painful to let go of. Joe recognised that it might not go the way he hoped, but he hoped she might feel something for him. I actually kind of liked that it didn’t go the traditional route of him helping her with her shop and ganging up to save it. I did get that from the movie, that she was running the shop for her mom. But the way the film was written and the way the film depicted her relationship with the shop, it portrayed running the shop as her calling. We saw that she truly belonged there, helping the kids find the books they needed, because it made her truly happy and fed her soul. That’s why I was so sad when she closed the shop, because it meant so much to her. She didn’t ONLY feel like she was supposed to be there, but like she was MEANT to be there. And if she’s not doing what she’s meant to do, will she really be happy even if she is with her soul mate? Haha, I see you really feel very passionately about this, and I think we are probably going to have to agree to disagree. You think she belonged to the shop and while I agree with this, I think it is a chapter in her life that is over. She moved on to find other things to be passionate about. Maybe their relationship won’t be able to survive what he did, but I guess we will never know. Haha I get “passionate” a lot. You should see me go head-to-head with someone over The Last Jedi. I’m grateful we had this discussion and I really did love your article. It actually made me respect the movie more than I did before, and I realized things before that I hadn’t when I’d first seen it. I might even rent it sometime and watch it again. Looking forward to seeing more of your work on MovieBabble! Oh my! Haha, did the person surrender to your argument about The Last Jedi? Love the last line of this review!